From the author of Waiting and War Trash: a political novel that follows an aspiring author, an outrageous book idea, and a lone journalist’s dogged quest for truth in the Internet age. ...a strange, intense novel from Ha Jin about the glories and limits of the freedom of the press ... one of the most unsettling books about the moral dimensions of modern journalism ... Aside from a delicious satire of book publicity — an industry so unhitched from reality that it’s hard to parody its exaggerations — The Boat Rocker also dramatizes the vast shadow world of Internet news. At once hilarious and sobering ... shows what happens when truthful stories hit the wall of Chinese politics, and it’s not pretty. At the same time, in crafting a memorable hero and a narrative that is both entertaining and thought-provoking, he affirms the value of fiction itself as not simply a source of profit, but a powerful vehicle for the truths of our times. As much a polemic as a work of fiction, The Boat Rocker describes an Orwellian world in which a single questionable judgment, coupled with a stubborn adherence to principle, exposes Danlin to life-shaking consequences ... 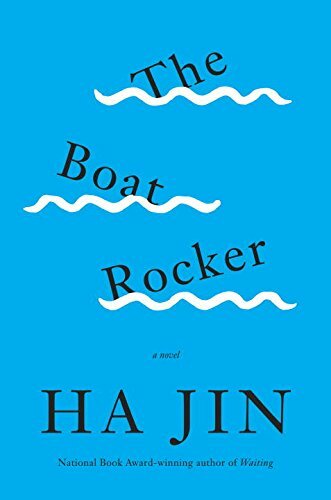 Written in Ha Jin's typically plain-spoken style, The Boat Rocker is not one of his finest works. Its plot turns seem both unlikely and cynical, and its dialogue can be stiffly political. But the author's own genuine anger at hypocrisy ultimately renders the title character, and his plight, sympathetic. What did you think of The Boat Rocker?